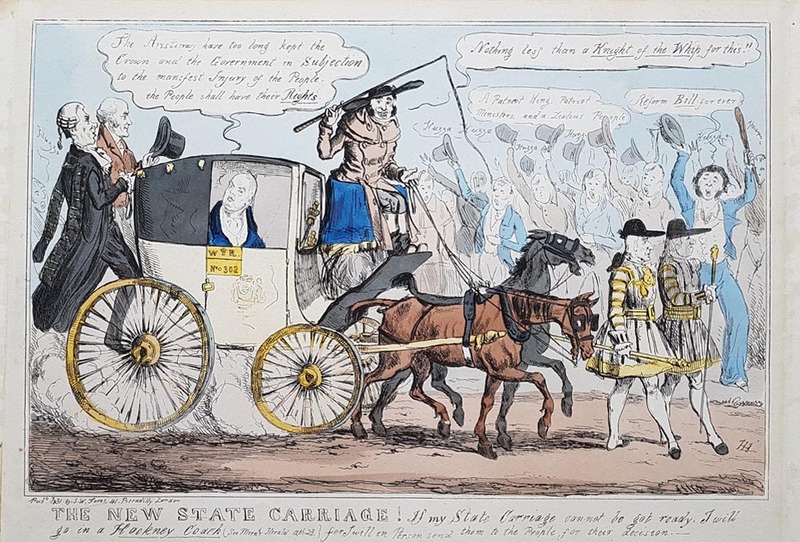 Description: A political cartoon depicting the King William IV in his carriage uttering the words "The Aristocracy have too long kept the Crown and the Government in Subjection to the Manifest Injury of the People, the People shall have their Rights." The coachman answers "Nothing less than a Knight of the Whip for this!!" Huzzas from the crowd with comments "A Patriot King, Patriot Ministers and a Zealous People" and "Reform Bill for ever". This is a comment on the Reform Act of 1832 aka Representation of the People Act 1832 or First Reform Act (to distinguish it from subsequent Reform Acts) was an Act of Parliament of the United Kingdom that introduced wide ranging alterations to the electoral system of England and Wales. Condition: Copperplate etching, image good, later hand colouring, some age toning and old mount marks to margins, stain to top left corner, image unaffected. Image size: 235 x 340mm, 9.25 x 13.25" approx.